The world produces 300 million tons of plastic each year. About two percent of it – around eight million metric tons – ends up in the ocean. It’s a staggering amount – yet only one percent of that plastic is actually found on the surface of the ocean. Half of that one percent winds up in trash vortices; the other half is more widely dispersed. That leaves 99 percent (7.92 million metric tons) unaccounted for each year. Where does it go? Science only began to unravel the riddle at the turn of the millennium when we uncovered a previously unknown phenomenon: microplastic. 80 percent of plastic waste ends up in the ocean, often via rivers. 20 percent is tossed overboard from ships. A portion of the plastic waste is carried great distances by ocean currents and gathers in the large trash vortices like the Great Pacific Garbage Patch in the North Pacific Gyre. On this journey, which can take up to 10 years, large pieces of plastic are progressively eroded, broken down by sunlight, and eaten by bacteria, fragmenting into many smaller pieces. The result is microplastic, meaning plastic particles that are smaller than 5 millimeters. 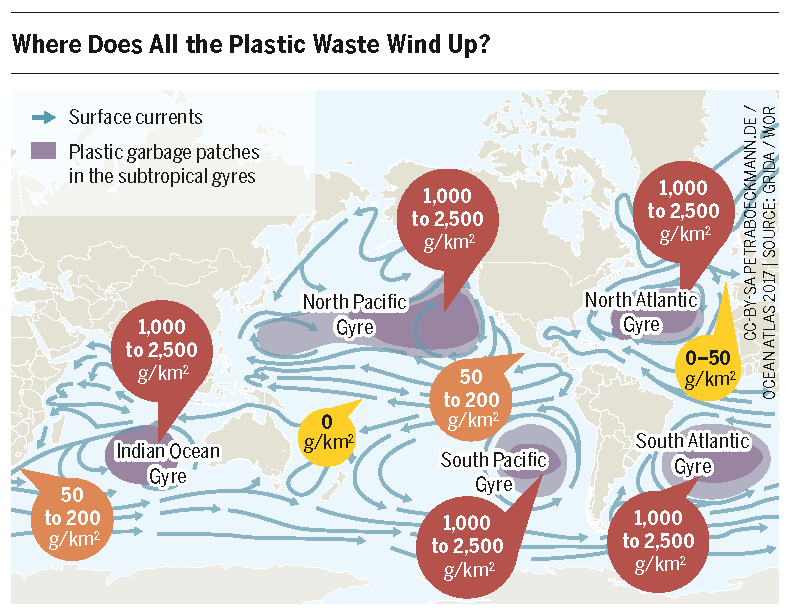 The plastic gyres are thus not the massive islands of trash that one might first imagine. Large bits of plastic are relatively rare, and one could actually swim through a gyre without noticing the microplastic that composes it. The remaining 99 percent of the waste that begins its journey on the coasts never reaches the garbage patches. It also breaks down into microplastic and disperses through the ocean before finally sinking into the depths. In fact, the plastic concentration on the ocean floor is 1,000 times greater than on the surface. The microplastic is trapped there, embedded in the sediment. It is gradually forming a new geological layer, the “plastic horizon,” which researchers of the future will attribute to our era. The sad truth is that we use the deep sea as a gigantic trashcan and benefit from the fact that the majority of the waste seemingly disappears forever rather than washing up at our feet again. The ocean floor is not the only “plastic sink,” however. Microplastic is also found in very high concentrations in floating sea ice. The ice is not as reliable a warehouse as the ocean floor, though: the accelerated melting of sea ice as a consequence of climate change could release 1,000 billion plastic particles in the coming years. That’s 200 times the amount of plastic currently found in the ocean. And while the portion of microplastic that remains afloat may seem small, it is the cause of a large problem with far reaching effects. Fish mistake it for plankton and eat it (and no wonder, since there is six times as much plastic as plankton in some parts of the ocean). Very small pieces of plastic can penetrate the fish’s intestinal walls and become trapped in the surrounding tissue. The microplastic then enters the food chain and eventually winds up on our plates – and in our own stomachs. The consequences of consuming microplastic have yet to be studied – after all, microplastic itself has only been a research topic since 2007. One finding is already cause for concern: the surface of microplastic acts like a sponge that soaks up toxins, including environmental poisons like PCB and disease-causing germs, helping them spread and threatening entire fish populations. Once plastic gets into the ocean, there is no way to get it back out. That is because most of it becomes microplastic, which is so small that the process of filtering it out of the water would also filter out the aquatic life as well. That would still leave the larger pieces of plastic that are so dangerous to larger animals. There are many technical solutions aimed at these aspects of ocean cleanup under development. Here as well we must consider the ecological consequences as well as the benefits. For instance, if one plans to scoop the garbage out of large areas of the sea, then fish and other organisms will also be caught unintentionally, as happens in commercial fishing. We must ask: how great is the benefit compared to the damage that will result? The solution to the problem actually lies on dry land, on coasts and river deltas, at markets and in households. And the good news is, it is within our grasp. That is because a significant portion of the plastic waste in the ocean comes from the packaging and products we use – and we can have a direct influence on it by changing our consumption. We can also ban the use of microplastics in cosmetics. But the most effective step of all that we can take is to build up a globally functioning recycling economy so that fewer new plastics are created and less are disposed of in an uncontrolled manner. Political engagement is a powerful lever for setting the right incentives to change.Developing a circular economy is just a matter of political will. 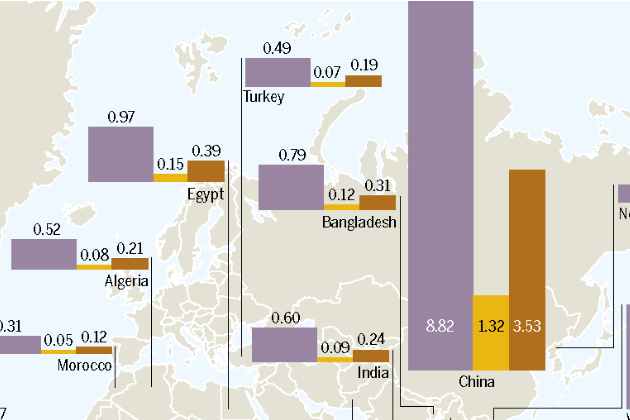 Infographic from the Ocean Atlas – Where does all the plastic waste wind up? 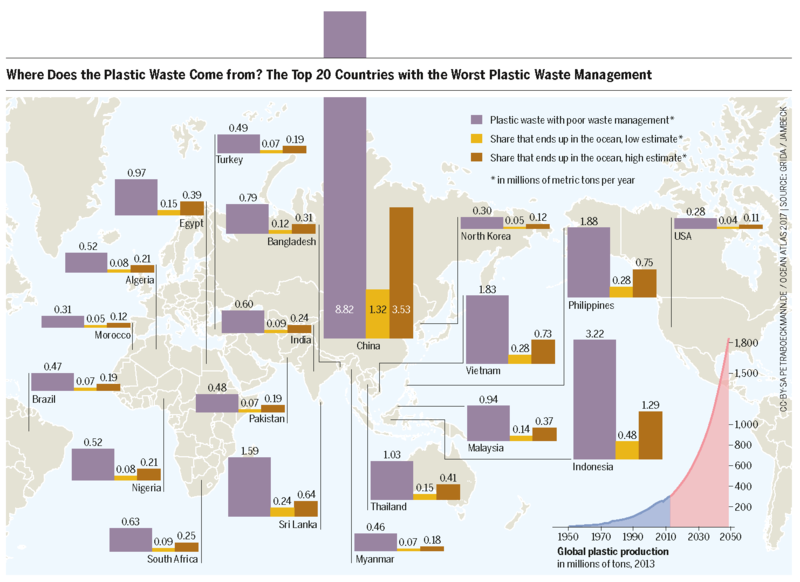 Infographic from the Ocean Atlas – How Does All that Plastic Get into the Ocean?